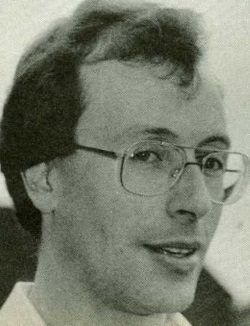 Most of David’s works have been conversions, and despite his low profile he’s been responsible for many hit Spectrum games. The CRASH Smash Deathstar Interceptor from System 3 (Issue 15), the highly-acclaimed Spectrum version of Activision’s H.E.R.O. (Issue 10) and the speech synthesis on Activision’s Ghostbusters (Issue 13) were some of his more significant projects. But where are the original games? David has rewritten Mercenary substantially: the intricate vector graphics routines had to be changed to get round the Spectrum attribute problems, and to take advantage of the computer’s speed. But most of the mathematics have remained unchanged because Targ, the planet where Mercenary is set, is a mathematical model — and as David says, ‘Paul Woakes is the only person who writes in mathematics to produce his games. That’s what makes them so brilliantly different. Woakes’s work is probably even more complex than the 4K PDP8 mainframe computers David began on. Trying to restrain his laughter, he recalls: ‘It was this great hunk of machinery that sat on a table and had a huge fan that used to make the table convulse when it was switched on. Then the ZX81 came along and it seemed like a miracle — you only had to wait a minute to know whether your program would run or not, but on the mainframe you had to let it run overnight. Then, after playing with a Lazer computer (similar to the Spectrum) and writing a Frogger called Savage Toad, David went to work for Atari. David stops suddenly, remembering that he isn’t supposed to say anything. Instead, he turns to fatherly advice for budding programmers.